The fifth women`s café, organised by the project femalerefugees@viadrina as well as the Verbuendungshaus fforst is going to be on the 10th of August 2017, from 4pm to 6pm in the fforst. We are looking forward to spend a nice evening with you on the terrace of the fforsthouse with coffee and cookies :) If you are interested in studying at the European University Viadrina or to get involved in the university otherwise, feel free to ask any questions! Please bring your children if you like! The fourth women`s café, organised by the project femalerefugees@viadrina as well as the Verbuendungshaus fforst is going to be on the 13th of July 2017, from 4pm to 6pm in fforst.This time, we will watch a video about equality together and hopefully have a nice discussion (there will be translators). And also, we invite everybody to bring something to eat. Coffee and cookies will be there as always. Feel welcome to bring your children! The third women`s café, organised by the project femalerefugees@viadrina as well as the Verbuendungshaus fforst is going to be on the 8th of June 2017, from 4pm to 6pm in the fforst. The Women's Cafe is open for all women and their children and creates an opportunity to play/listen to music, learn German, English and other languages, to network, to cook, to watch movies or just have a nice evening with tea. Come over and join us! The women`s café is regularly on the second Thursday of every month! Also check: Facebook Gleichstellungsbüro Viadrina or Verbuendungshaus fforst! On May 11th 2017 the second women`s café organised by femalerefugees@viadrina with the support of Students' Union took place in the Verbuendungshaus fforst. We thank 25 women and children who joined us on the terrace in the sunny evening for the conversations about our lifes in Frankfurt (Oder). We are happy about all the interest that has been expressed in various university offers, as well as in studying at the Viadrina. We hope to come across some of you on the university campus and, of course, to meet you at the next women`s café which is taking place on June 8th, 2017 at 4pm in Fforsthaus! Das Frauencafé ist offen für alle Frauen als auch ihre Kinder und schafft die Möglichkeit in entspannter Atmosphäre gemeinsam zu musizieren, zu spielen, Deutsch und andere Sprachen zu lernen, sich auszutauschen, Kontakte zu knüpfen, zu kochen, Filme zu schauen oder einfach nur einen schönen Nachmittag zu verbringen und Tee zu trinken. Kinder sind willkommen! The Frauencafé from FemaleRefugees@Viadrina of the office of equality and the Fforst took place last thursday, the 1st of december! Overall 30 women and children got to know eachother in the Verbuendungshaus Fforst and enjoyed a lovely evening with lots of games, handicraft works and making music. The positive feedback is encouring us to proceed the Frauencafé next year! 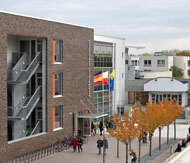 A big thank you is also going out to the AStA Viadrina for supporting our project! The Women's Cafe is open for all women and their children and creates an opportunity to play/listen to music, learn German, English and other languages, to network, to cook, to watch movies or just have a nice evening with tea. Join us! Children are welcome! Le café pour femmes est ouvert à toutes les femmes et à leurs enfants et crée une occasion de jouer / écouter de la musique, apprendre l'allemand, l'anglais et d'autres langues, faire du réseautage, cuisiner, regarder des films, ou juste avoir une belle soirée avec thé. Rejoignez-nous! Les enfants sont bienvenus! Die Veranstaltung ist Teil des Projekts FemaleRefugees@Viadrina.